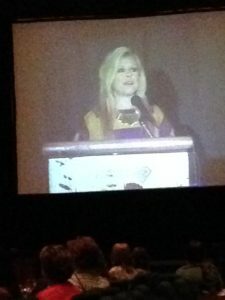 The Real Blind Side Leigh Anne Tuohy visits Lake Charles! 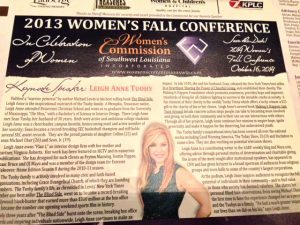 Leigh Anne Tuohy provided an inspirational message to hundreds of women who attended the 2013 Women’s Commission Fall Conference. Every Fall, the SWLA Women’s Commission sponsors a conference for women held in Lake Charles, LA It is a day of educational speakers, fun workshops, a marketplace of vendors and a luncheon with a keynote speaker at the Lake Charles Civic Center. The come and go session workshops throughout the day offer women a variety of spiritual, health, creative, career and fun topics of interest. 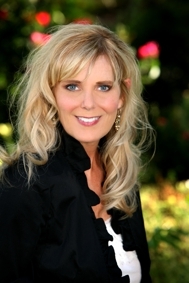 Leigh Anne Tuohy and her family were portrayed in the hit movie The Blind Side which is the inspirational story of Michael Oher. If you saw the movie or followed Michael Oher’s life story, he is noted for his collegiate football at Ole Miss and now his success continues with the Baltimore Ravens and a Super Bowl win! 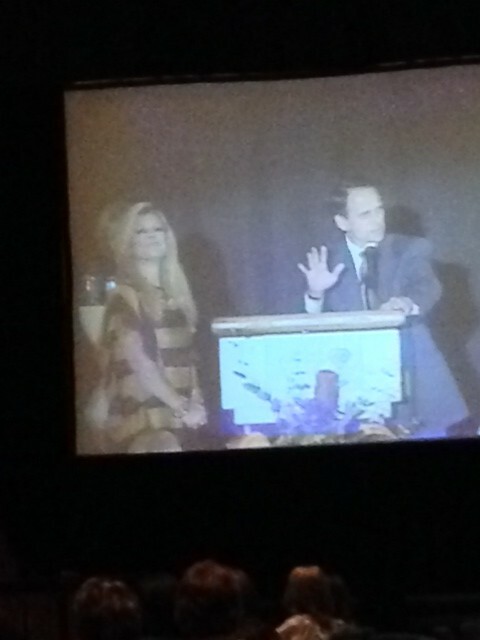 It was refreshing to see and hear Leigh Anne Tuohy speak. She shares that she and her family are just "real"just and average 'Joe' like you and me. You don't have to be rich to make an impact in someone's life. Everyday people can make a difference and mentor others, plug yourself in giving in some way. I loved that she shared: "God uses simple people to tell a story"
After Leigh Anne finished her keynote message she was presented the key to the City of Lake Charles by Mayor Randy Roach and the key to the City of Sulphur by Mayor Chris Duncan. A little kindness no matter how small goes a long way! You never know whose life you may impact. The Real Blind Side Leigh Anne Tuohy visited Lake Charles and touched me with her geniune and caring insight! Listen to the complete KPLC TV interview of Leigh Anne Tuohy and I think you will agree that she is just as true and inspiring as The Blind Side story. CENTURY 21® is a registered trademark owned by Century 21 Real Estate LLC. An Equal Opportunity Company. Equal housing Opportunity. Each office is independently owned and operated. The information contained in this blog is believed to be reliable and while every effort is made to assure that the information is as accurate as possible, the author of this blog, and its comments are not warranted or implied representation of it's accuracy, All information is copywritten and the property of the Author, Marilyn Boudreaux. 498 Hardwood- Moss Bluff LA Home for Sale on 1 Acre!